Can you recall the first time you ever gave up on something? I can't. I know it wasn't when I was learning how to swim, ride my bike, tie my shoes, or beat Super Mario at the arcade. So it must have been sometime after childhood. I bet this was the same for you. You were probably just as dogged and determined as I was in your childhood. I gave up on a few fledgling relationships as a teen out of fear of commitment. I regret that to this day. Those were some quality girls. While living in San Jose, CA, I didn't even try to set up a website during the dotcom era out of fear of failure. So you can say that I have quit a few times in my life. But I can proudly say that I haven't quit or given up on many things. I've tried lots of things too! In other words, I never made quitting a habit. One of the best books I have ever read on success, The Slight Edge: Turning Simple Disciplines into Massive Success and Happiness teaches that 95% of people become quitters because they 1) Hear too many "No's" in their life, 2) Quit so often it becomes habitual, and most importantly, 3) Don't have a philosophy. Not having a personal philosophy makes you prone to waning motivation, inspiration, and perseverance. Being fickle is very much a human thing. If you are part of the 95% that Jeff Olson describes, how can you get out of this large cohort? Literally, how can you stop being a loser? After all, not many "winners" in life have all aspects of success covered: health, relationships, happiness, wealth, societal impact/fame, and accomplishment. Only 5% of people get there according to Olson and I tend to agree. If you want to be part of this 5%, you'll need to make one fundamental move: Come up with a personal philosophy. A personal philosophy is the foundation that never cracks. It is the anchor that never lifts or let goes. Just how do you go about getting your own personal philosophy? 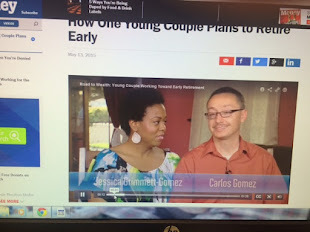 Here is a great resource. Once you develop your personal philosophy, you have to obviously live by it. Olson reiterates that you have to be willing to do the little things, take the necessary little steps toward your goals, even when the results aren't initially evident. Success is something that doesn't play out overnight, and when it is obvious, most people have already accumulated (like compound interest) all the necessary actions one at a time, day in and day out. Unfortunately, we have been programmed to perceive success as something that needs to happen right away. Everything about our society is instant and this hurts not only our youth who have developed zero patience, but also adults who have embraced the 21st Century. You must understand that one of the reasons you quit is because you have such a strong sense of immediate gratification. Being aware that the urge to see results may be discouraging your stick-to-it-iveness is a huge leap forward. 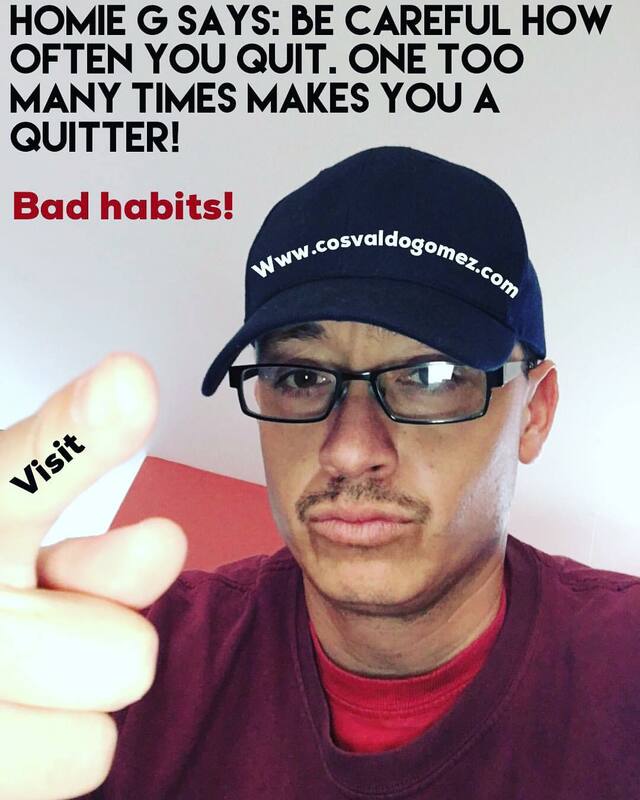 The habit of quitting can be broken over time, but you must be willing to do the things you need to do even if it's more comfortable not to. Realize that though choosing not to exercise, eat healthy, work on your goals, etc. may not kill you on that day, if this keeps up, one day the chickens will come home to roost. Olson is dead on with this perspective. You don't see the sun damaging your skin, but 20 years from now you'll be one wrinkled beast...and it's because you chose not to put on sunblock on some sunny days. 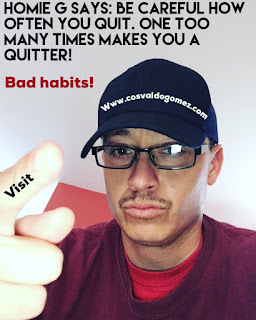 If you have sized yourself up after reading this post and feel you may be a "quitter," I suggest you read, The Slight Edge: Turning Simple Disciplines into Massive Success and Happiness , and get out of your rut. Thanks for staying with me. If you liked this post and want to get more like them in your inbox, please subscribe below.